SCOTLAND'S LEADING FEMALE POLITICIANS BACK GIRLGUIDING SCOTLAND & WOMEN 50:50'S NEW CAMPAIGN TO EMPOWER GIRLS TO LEAD. 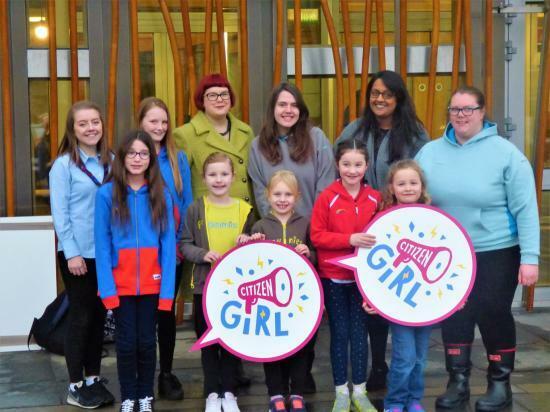 As part of celebrations marking Scotland's Year of Young People and 100 years since some women first gained the right to vote, Citizen Girl aims to engage girls in politics and show them how powerful their voices can be. As the leading charity for girls and young women in the country, Girlguiding Scotland, hopes it's near 50,000 members age 5-25 will take on the Citizen Girl challenge and explore themes of equality and representation through fun activities - from building their own edible parliament to holding their own Citizen Girl summit. First Minister Nicola Sturgeon said: "Organisations such as Girlguiding Scotland play a vital role in ensuring that the voices of young women and girls are heard and acted on. "Citizen Girl is an initiative that I warmly welcome. It will create new opportunities for girls and young women to shine locally and nationally. "The Scottish Government is committed to tackling gender inequality and celebrating the many and valued contributions of young women and girls, in Scotland." Labour MSP and Women 50:50 co-founder Kezia Dugdale said: "A century on from some women receiving the vote for the first time, women remain underrepresented in positions of influence in Scotland, giving them unequal access to power, decision-making and participation throughout public life. That simply has to change. We need it now, and thanks to the incredible work of organisations such as Girlguiding Scotland and Women 50:50, I believe we can secure natural justice for women and end this block to economic progress." Ruth Davidson, Leader of the Scottish Conservatives, said: ““The first women to win the vote did so 100 years ago and this anniversary affords us the chance to see how far we’ve come - and how far we’ve still got to go. “I congratulate Girlguiding Scotland on the launch of Citizen Girl - every young woman should feel empowered to find her own voice and this campaign will help achieve that". Women 50:50 are delighted to be a part of Citizen Girl and we can’t wait to see what these inspiring young women achieve when they make their voices heard." As the leading charity for girls and young women Scotland, Girlguiding Scotland is offers girls age 5-25 a safe space to enjoy new experiences, learn new skills and grow in confidence - from camping to campaigning, social action to international travel.